Luxury haircare is always a big treat and while it's one of the beauty buys that I always feel a bit guilty about, the difference it can make to your hair always makes it worth it. We recently met up with Paul Mitchell to hear all about their new products and one of the latest ranges to come out is the Paul Mitchell Marula Oil range. With an oil that is said to have 50% more protective antioxidants than argan oil, I couldn't wait to get my hair washed and ready to be nourished. Bring on the beautiful hair! Starting off with the Marula Oil Rare Oil Replenishing Shampoo and Conditioner, it comes in a salon style pump which makes it really easy to dispense the product. Paul Mitchell are gradually making a move towards sulfate free haircare and this range is one of which that doesn't contain any. Even though I know that sulfate free haircare is better for your hair in the long run, I often worry that the hair washing process won't be as thorough and it will take much longer to rinse as a result. This isn't the case thankfully as the product foams up just the right amount and you can feel your hair is completely rinsed of product. It doesn't quite have that squeaky clean feeling but I find it's much more nourished in the long run. The conditioner compliments the shampoo greatly, being not too thick but enough to soften the hair and make a difference. I'm a big fan of these two. While I can see the benefits of using the shampoo and conditioner on their own, if I feel my hair needs extra nourishment I reach for the Marula Oil Rare Oil Treatment. Much like the way you'd apply argan oils/moroccan oils etc, you pop it on while your hair is wet and it helps smooth out the hair. We were warned before trying out the oil that you should use it sparingly and while it suggests 1-2 drops, with my long thick hair I found that 4 seemed the right amount for me. So it really depends on the length and thickness of your hair on how much you should use. I found this oil perfect during the little heatwave we've been having as it completely removed any frizz and my hair felt so soft and nourished. A must have for humid weather and can even be used on your skin too. If you still find the 3 products above aren't enough, luckily there is a Marula Oil Rare Oil Intensive Hair Masque. Despite being an oil mask, it's actually quite light in texture.. almost the same sort of consistency as yoghurt. You simply pop it all over your hair and leave it on for a couple of minutes, or longer if you really want an intensive treatment. I popped this on in the bath a few nights ago and after rinsing it honestly felt like my hair had been repaired. It felt so strong and silky and I could see the effects of the mask continue as the days went on. If I had to choose between the oil treatment and the mask, I'd probably go for the oil treatment but I really enjoyed using this product. 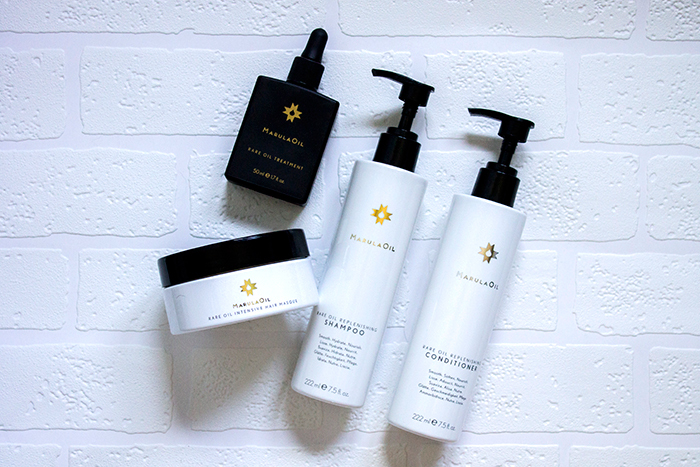 Now you may be wondering how you can get your hands on the Paul Mitchell Marula Oil range. Paul Mitchell products are only available in salons so if you're looking to make a purchase, you can call 0845 659 0012 for your nearest salon as the website salon locator is currently under maintenance.